Just because this appears in a slide deck, doesn’t qualify it as a visual aid. Power pointers everywhere, can we talk? The time has long passed for you to be creating slides featuring 79 word-paragraphs. It’s not a good idea to share detailed graphs with data that’s indecipherable from even the first row. And no one wants to see your meticulously footnoted sources during a stand-up presentation. That’s what handouts are for — and no, they’re not the same thing. 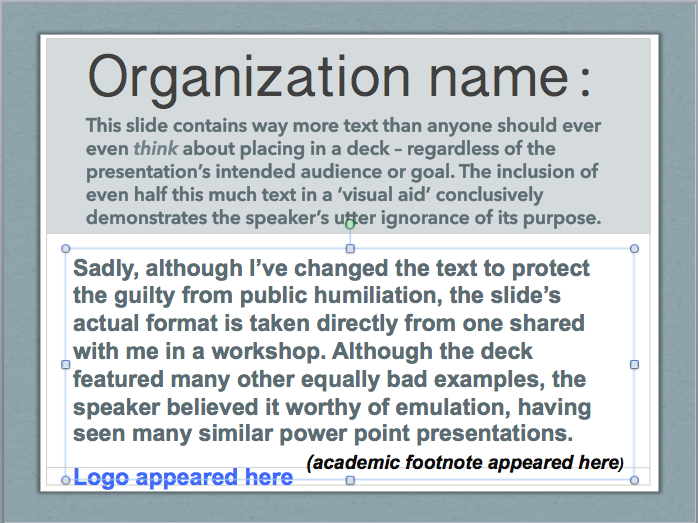 I’ve seen enough truly terrible slide decks to know that the practice of using a Power Point-based presentation as both visual support and handout is common practice in government, academia and some business circles. But that doesn’t mean it’s defensible. That wasn’t even a trick question; it’s very straightforward! Slides featuring lots of text fail on the first point; slides featuring complex and/or hard-to-read visual information fail on the second point. Paragraphs and long sentences are inherently not visual. And please don’t read the text off the slide: audiences can generally do so much more quickly. On the other hand, you don’t want to put up a text-heavy slide and then deliver supplementary or contextual information. This forces your audience to choose: do they read your slide, or listen to your comments? Because here’s the thing: THEY CAN’T DO BOTH. Not effectively. Not even the ones who think they’re great multi-taskers. They’re wrong. Our magnificent brains have their limits, and this is one of them. Some people will choose to focus on the slide, tuning you out. Others will choose to listen, and ignore the slide. Either way, you’re muddying your message and confusion is likely to result, regardless of whom you’re addressing. Even highly-educated academic audiences, accustomed to seeing slides that have too much information on them, benefit from and appreciate a simpler presentation of information. And simpler doesn’t have to mean simplistic. 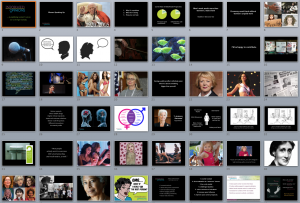 As just one example of an alternative approach, here’s the slide sorter view of a guest lecture I gave at McMaster University last year. information clear and accessible, breaking up the content so no single slide has more than a few words on it. Moreover, you’ve seen enough advertising campaigns to understand that point form text is easier to scan and absorb than paragraphs or long quotes. Before TED talks changed our expectations, the accepted guideline was no more than 6 points on a slide, with a maximum of 6 words per point. But now, depending on the context and content, even bulleted text often seems unnecessary. We live in an image-rich environment. And that old saying about a picture telling a thousand words? There’s a lot of truth in it. Sometimes your theoretical or specific information can’t be replaced by an image. But chances are very high that you can dispense with articles, prepositions and entire clauses to visually reinforce the key phrases you want people to grasp and remember. Fundamental to the act of presenting live, in a room, with other people, is the potential for a dynamic exchange. If a speaker delivers information in a way that would be more easily absorbed through a written document, that potential is wasted. Informed Opinions offers both one-on-one coaching and tailored workshops to support speakers in becoming more engaging and effective presenters. We’re happy to chat about whether and how we can help you achieve your speaking goals. Brilliant, Shari! I used to advise my public speaking classes that if they ever hear themselves saying out loud to an audience: “Not sure if you can read this slide from the back of the room….” , then that’s their cue to trash that slide. And there’s an additional distraction often seen in too many corporate seminar rooms: not only the slides on the big screen, not only the speaker reading each slide word for word (in case anybody in the room doesn’t know how to read), but there’s also the frickety-frackin’ pages of stapled Power Point handouts that each participant receives in advance so they can stare down at that! Thanks so much for this – love your title.